The funded HORIZON 2020 consortium, ONLINE S3 invites regional and national authorities across Europe to collaborate in piloting the design and implementation of an e-policy platform, augmented with a toolbox of applications able to service the research and innovation strategies of smart specialisation. 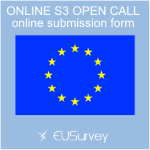 This open Call for Pilots proposes to select two national or regional authorities from EU Member States that can work with the ONLINE S3 consortia in piloting the platform’s design and implementation. Two national and regional authorities are already participating in the piloting stage. These are Scotland and the Central Region of Macedonia. The two additional authorities selected from this open call shall each receive a maximum budget of 98,000 Euro to test the platform’s toolbox of applications. Further details about this opportunity and process to follow in responding to the call are available at : https://ec.europa.eu/eusurvey/runner/ONLINE-S3-OPEN-CALL . The ONLINE S3 consortia is looking forward to receiving your application!